The Chinese yuan is surging midweek as investors are optimistic about Washington and Beijing nearing a new trade agreement that would end this year-long standoff between the world’s two largest economies. Although President Donald Trump and President Xi Jinping will not meet prior to the March 1 deadline, both sides are positive that crucial developments can be made in the final days of the trade truce. Before the latest round of negotiations conclude, Treasury Secretary Steven Mnuchin and Vice Premier Liu He will meet. It has been suggested that the deadline to raise tariffs on $200 billion worth of Chinese goods could be delayed if it is believed that both sides are close to completing a trade pact. According to reports that cite sources close to the situation, there appears to be several roadblocks or key issues in the discussions: foreign exchange, intellectual property, and trade balance. Despite the US president accusing China of being a currency manipulator, the Treasury Department has officially refrained from labeling the country as such. Investors’ heads are turning on a recent Development Research Center of the State Council (DRC) report that suggests the US economy will remain the sole superpower until at least 2031. It had been long assumed that China would surpass the US in gross domestic product (GDP), but with the latest economic data and predictions, some researchers do not believe it will happen. That is not to say that the consensus is China will crumble. Last month, Standard Chartered Bank forecast that China would top the US as the world’s largest economy next year. Is the DRC correct? There are many reports that suggest the national economy will need to overcome a lot of hurdles. On Wednesday, the Nikkei Asian Review published housing estimates from Gan Li, a professor at Southwestern University of Finance and Economics in Chengdu. The report concluded that there are 65 million empty apartments across the country, with sales volumes plunging 44% in 24 cities during the first week of 2019. On the data front, consumer spending on retail goods and dining out during the week-long Lunar New Year topped one trillion yuan ($149 billion). This represents an 8.5% year-over-year growth, but this is the lowest growth since 2005. 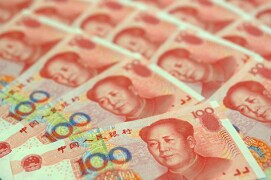 The USD/CNY currency pair tumbled 0.2% to 6.7603, from an opening of 6.7738, at 17:49 GMT on Wednesday. The EUR/CNY fell 0.68% to 7.6253, from an opening of 7.6778.